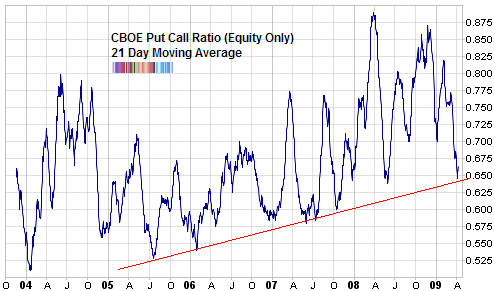 The ISE call put ratio, otherwise known as the ISEE index started the week off fairily high. The equity only sub-index came in at 169 on Monday and continued to stay elevated. On Tuesday it was 170 and today it closed at 167. I’ve found the ISE sentiment tough to decipher during this bear market because of how strange it has acted but the 3 continuous days at 169 and higher show a level of call buying that we haven’t seen since very late last year (Christmas and beyond). That, as you’ll remember, was a very poor time to be bullish on the stock market. Remember Jim Cramer? The guy who was gutted like a fish by Jon Stewart? The guy who went on TV, almost weeping, telling people late last year to take their money out of the market for the next 5 years? Yeah, that guy, he’s bullish again and leading “Cramerica”, once again, to the slaughterhouse. Last Thursday he announced that the “depression” is over and the market has seen the bottom. With the Alcoa (AA) kicking off earning season, we are now in a market cycle which lasts about a month and which is well known for its weakness. I’m not sure why exactly earning season is a bad time historically to be invested in the market but it is. Numerous studies have shown it to varying degrees. You can stay up to date with this earnings calendar from the Wall St. Journal. Finally, as I’ve mentioned already in previous sentiment overviews, we’ve seen a general return to optimism through the various sentiment indicators and surveys. Although some of this is to be expected and warranted for a return to normalcy, it is another element we have to throw into the pot. From what I hear on CNBC, there has been lot of covered calls being sold lately. This will somewhat explain your charts. Also, this is trickling into reduced VIX. Does the covered call activity/strategy concern you in your posture that we will see correction here? Vin, that would definitely be a factor. Especially considering the extremely low interest rates and how option selling is a way to generate yield. Having said that, there are specific ways of measuring option activity which filter out a lot of that. For example, the ISEE index I mentioned only counts small or retail opening trades in calls and puts. So as always there are cross currents to navigate but I think if we look carefully it is possible to detect old patterns. Strong cross currents may lead to a sideways market, i thought sentiment and news flow was quite bullish yesterday, surprising after Alcoa’s results. Excellent posts as usual Babak. Cramer should not be referenced. His lack of credibility erodes all who refer to him. Anyone who has already taken advice from him or his sponsor is unfortunate enough already - there is no need to spread the malignancy. I believe Doug Kass has correctly made great overall market direction calls the last few years. According to your weekend posts, Kass thinks the market will consolidate over the next couple of months and not go much lower. Also, he sees markets rocketing higher in summer. With VIX trending lower, I’m jumping in his camp. I think all the overbought indicators will only percipitate into small corrections and not test of March lows. I disagree. He seems to distill market sentiment in himself. He is a good contrarian indicator. Just listen to what he advises and do the opposite. He is there to give people the opportunity to learn from their mistakes. He represents the mistakes of the investorati. It is probably easier for people to learn from someone who is wrong and waves flags and jumps about rather than a softly spoken boring (and wrong) mainstream market commentator who can more easily later hide his mistakes.